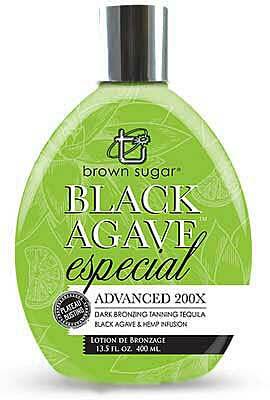 BLACK AGAVE 200 X Special Bronzer by Brown Sugar - 13.5 oz. Home/Tanning Bed Lotion /Tan Inc. Brown Sugar/BLACK AGAVE 200 X Special Bronzer by Brown Sugar - 13.5 oz. We have mixed up a color cocktail never dared before. A Black Agave Tequilana Extract & Hemp infusion will have you daydreaming of high tides & beach vibes. Inspired by the tropical beaches of Cancun, this 200X Bronzing Tanning Tequila is an intoxicatingly dark formula that will bestow your tan with that just from the beach glow.